Giant squirrel, turkey, bat & acorn cookies that are delectably iced in hues of green, brown, orange and yellow icing, undoubtedly bespeak autumn. Who doesn't love the furry cuteness of a sugar squirrel as it jumps across the lawn with a mighty acorn in its mouth or the hooting of an inquisitive owl perched high up on a tree in the distance this time of year? The plumage of heritage turkeys is a sight to behold, but when it takes the form of a cookie, anything goes. What matters here most is that you, the baker, have fun when making memorable cookies. My Martha by Mail copper cookie cutters which have now become iconic, get used throughout the year for baking. The ones that I chose (Sugar Squirrel & Mighty Acorn, Chubby Pumpkin & Tom Turkey and Owl & Bat) are among my favorite. I wanted the cookies to be specific for gifting to individual friends, so I didn't use every single cutter from these sets. Admittedly, there are no green squirrels, orange owls or yellow-feathered turkeys in nature that I know of, but that's alright. Let's stretch our imaginations just a little bit and make cookies that are colorful, tasty and absolutely outlandish. Keep in mind that every cookie you see here was made with my Sugar & Spice Cookie Recipe and, of course, that Perfect Royal Icing. Last, but not least, are the embellishments of pearl candies and colored sanding sugars. A green Sugar Squirrel will surely delight anyone with a sweet tooth. Trace the squirrel's tail with orange icing, leaving some cookie exposed. Flood it with icing of the same color; let dry. Pipe a green belly with royal icing and flock it with green sanding sugar; let dry. Wipe off any stray sugar crystals with a fine brush. Pipe the rest of the squirrel's body & fill it with a mint-green royal icing, setting a black pearl candy for an eye. Let dry. This stately Tom Turkey is fit for Thanksgiving dessert. Outline and flood the turkey cookie with dark brown royal icing; let dry. With mint-green royal icing, delineate feathers, feet, and an eye. Let dry. Pipe dots around outlines with dark-brown royal icing and chartreuse dots within the confines of the tail feathers. Let dry completely. A three-toned Mighty Acorn was given the royal treatment. Starting from the top: outline the cap of the acorn with dark-brown royal icing and flood it, giving the shape a scalloped border. Immediately pipe the next row with a dark orange shade of royal icing. Finish the acorn with mint-green royal icing. While wet, carefully drop pearl candies along the points of the scallops. Let dry completely. The Wise Owl is certainly a colorful hoot! Outline and flood the adorable head in brown royal icing and while still wet, pipe two large green eyes and small orange dots for its "brow". Drag a toothpick through the brow to create bleeding hearts. Center 2 orange pearl candies for eyes. Let dry. Outline & flood orange wings and add pearl candies along the edges. Flock the wings with fine sanding sugar while wet. Let dry and brush off stray sugar crystals. For bottom feathers, outline and flood with a mint-green base and add brown dots. Drag a toothpick while the icing is still wet to create bleeding hearts. Let dry. Pipe a beak with black royal icing. A grand Tom Turkey cookie is classic Americana. Outline and flood the entire base with a yellow royal icing (I added a hint of orange to tone down the bright yellow) and let dry. Pipe a bead of brown royal icing along the neck, head, breast & feet of the turkey. Pipe beads of orange royal icing to delineate feathers. Flock with fine sanding sugar. Pipe orange dots along the bead of brown royal icing and don't forget to add an eye. This Orangey Owl is simple in its design. Outline and flood its head with orange royal icing and flock with fine sanding sugar. Let dry completely, then brush off any stray sugar crystals. Pipe eyes in mint green and add black pearl candies for pupils. Add a beak with black royal icing. For the wings, outline and flood with brown royal icing then add mint-green dots around the perimeter. Drag a toothpick through the dots to create bleeding hearts while the icing is wet. Add a mint-green neckline and a dark-green tail. Le Brown Squirrel is adorable! Outline and flood a small orange belly, then do the same for its body with brown royal icing. Add an orange pearl candy for an eye. Pipe a large tail with green royal icing and flock it with fine sanding sugar. The Sparkly Acorn cookie just fell off a cookie oak tree! Outline and flood the acorn's cap in green royal icing, giving it a scalloped edge, and flock it with fine sanding sugar. Let dry and brush off any stray sugar crystals. Outline and flood the rest of the acorn in brown royal icing and flock the small tip in mini non pareils. Add orange pearl candies around the scallops and let dry completely. Voila! 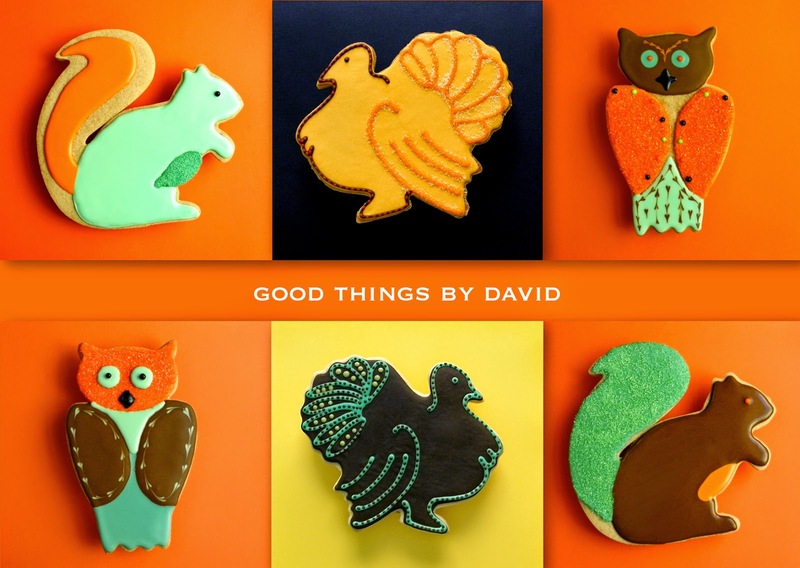 Don't hesitate for one moment to create your very own autumn critter cookies this weekend for Thanksgiving. Lay out a platter of them or stack them onto those cake stands that you ardently collect. Have cellophane bags at the ready and beautiful ribbons to tie up the cookie parcels. Take it from me, everyone is going to want one of your cookies at the end of the feast. Make plenty of them!